Full-day and half-day classes featured some of the top instructors in the decorative arts industry. The sharing among artists at ArtFusion was profound. In cooking, "fusion" refers to a combination of different cuisines to create a singular culinary experience. In Santa Fe, ArtFusion brought decorative artists together in a combination of talent that created a singular inspirational experience that satiated their desire to network, share and learn from one another. Classes, speakers, exhibits, demonstrations and social events were all ingredients that flavored this event, which attracted more than 100 decorative artists, instructors, exhibitors and sponsors. Iron Faux was a fast-paced and fun competition among artists. ArtFusion is a new industry event, organized by Kathy Boyd who already has a successful track record for bringing artists together at a series of Faux Retreats over the past several years. Offering valuable assistance in the organization of this event was Charlee King. ArtFusion is a variation on that concept, accommodating a larger number of artists and instructors but still providing a closeknit sense of community among those in attendance. "We had close to 120 people who registered," Kathy reports. "I had been wanting to do something like this for a long time at as low a cost as possible to make it affordable for the instructors, exhibitors and students. We got awesome feedback from those who attended, so I'm very grateful and feel very blessed that so many industry pros, exhibitors and instructors came to the event and it was such a success." ArtFusion took place Nov. 3-6 in Santa Fe, N.M., one of the most artistic cities in the United States. The century-old Scottish Rite building, located in Santa Fe's Historic District, offered a unique and fascinating setting with a diversity of rooms and impressively ornate theater. in the beautiful theater of the historic Scottish Rite building. During ArtFusion's hands-on classes, attendees had the opportunity to learn some of today's most groundbreaking techniques and finishes from many of the top instructors in the decorative painting industry (Sheri Zeman, Melanie Royals, Igor Turovskiy, Gary Lord, Deb Drager, Shauna Gallagher Beki VanMeter, Adrienne Wannamker and Darlene McElroy, to name just a few). "The feedback we got on the classes was good," Kathy says. "People liked the fact that there was a variety of instructors and classes that you're not going to see at other industry events." For instance, there was a class on "Funky Chunk Finishes for Cabinets and Furniture" by Debbie Hayes. Another class by Cathy Taylor showed attendees how to create vibrant works of art with alcohol inks. 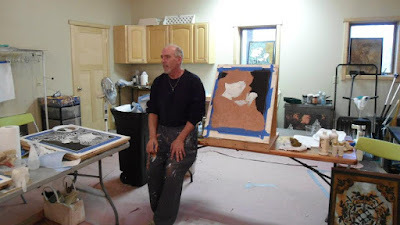 Alan Carroll introduced attendees to the intriguing world of grisaille (or monochromatic gray) painting while Patti Halstead Schotterlein took her class to a new dimension with "Underground Faux." The opportunity to do lightweight exterior bas relief panels was provided by instructor Cindee Lundin. Meanwhile, Angel Wynn taught her students how to combine their photographs with the ancient process of encaustics. "A lot of people are wanting to get off the scaffolding, and that's what a lot of those classes entailed," Kathy says. Attendees also had the opportunity to attend a variety of business presentations in the Scottish Rite Theater. Diane Capuano Franklin, co-founder of Focus on Faux, had the opportunity to speak at the event on the subjects of faux trends and social media. Dr. Brenda Schaeffer, a licensed psychologist, was on hand to talk about the origins of creativity. ArtFusion also featured some unique social activities, such as a "fauxtini" party and an IronFaux competition in which artists worked diligently and creatively to complete a finish within a specific time limit. Other events included a welcome reception and a night out for dinner and music. When not attending classes and social events, attendees had the opportunity to visit the exhibit hall to see products and demos from major manufacturers as well as some beautiful displays of art in an art show headed by Crystal Guthrie. Kathy makes it a point to include a charitable component in many of her events, and ArtFusion was no exception, with donations from attendees encouraged. "I try to do a different one for every different event," she reports. "This one was for Caring with Colors as well as the Scottish Rite (Masonic) building. There are buildings like this all over the country, and many are struggling to stay open. So, we wanted to do what we could to help." Now that the first ArtFusion has successfully concluded, Kathy is contemplating what the next ArtFusion will be. It likely will include many elements of the first ArtFusion but with some additional unique elements as well. "My goal is to do things differently that not everyone else is doing," Kathy says. "I never want to do anything that seems like a copy of something else. I've had 20 Faux Retreats since 2009, and it's been different every time. If someone comes eight different times, they get eight different experiences." Whatever ArtFusion becomes in the future, it sounds like it will likewise continue to be a unique and memorable experience. Certainly the ingredients of great instructors, valuable education, entertaining social events and opportunities for networking will be included—all fused together to create another winning recipe. This is a free preview of Focus on Faux. To access other articles, click on the link to sign up for a subscription plan. Subscribers have access to 5-7 new articles per month, new product section, info on upcoming events plus a monthly e-newsletter.